Brenda Westerbur Gill ’04 is a stay-at-home mom. She just welcomed a little son, Jonathan Richard Jr on September 23, 2011. He joins his older sisters Abigail and Lucie. This news was submitted using our Submit Your News form. If you have any news you'd like to share, please let us know! Tim Wilson ’01 has taken a new position as a Research Associate at the Cambridge Institute for Medical Research, Cambridge, United Kingdom This news was submitted using our Submit Your News form. If you have any news you'd like to share, please let us know! Alison Brown Hahn ’00 had a daughter, Julia Elizabeth Hahn, on May 29, 2011. This news was submitted using our Submit Your News form. If you have any news you'd like to share, please let us know! 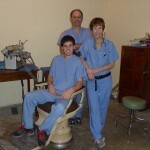 Meghan LaVelle ’04 finished her Doctor of Nursing Practice (DNP) at the University of Minnesota in Fall 2011. This news was submitted using our Submit Your News form. If you have any news you'd like to share, please let us know! Meghan Harney ’02 and her husband Brian Sandri had a baby girl, Moira Elizabeth Sandri, on 1/26/12. This news was submitted using our Submit Your News form. If you have any news you'd like to share, please let us know! Lisa Bauer Millin’99 and Matthew Millin welcomed a son, Cooper Matthew, on October 5, 2011. he joins Nathan (8) and Olivia (5). This news was submitted using our Submit Your News form. If you have any news you'd like to share, please let us know! Beatrix Lynn Cook was born November 28, 2011 to Chris Cook ’00 and Stacy Cook (UCLA 2003) This news was submitted using our Submit Your News form. If you have any news you'd like to share, please let us know! Martin Kaduc ’01 married to Christine Christoffersen on January 21, 2012 in Leavenworth, WA. This news was submitted using our Submit Your News form. If you have any news you'd like to share, please let us know! Thomas Stanley Wagner was born on October 25, 2011, to Sue Halverson Wagner ’03 and Jamie Wagner . He has an older sister Elizabeth. This news was submitted using our Submit Your News form. If you have any news you'd like to share, please let us know! Ava Lambrecht ’08 is studying Nonprofit Management at Hamline University in Saint Paul, Minnesota. This news was submitted using our Submit Your News form. If you have any news you'd like to share, please let us know! 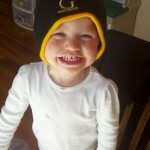 Future Gustie Brooklyn, age 2, daughter of Scott ’87 and Jennifer Slick. This news was submitted using our Submit Your News form. If you have any news you'd like to share, please let us know!